Coconut is a monocot and is thus only distantly related to most tree nuts. Couturier et al. (1994)  reported vomiting, diarrhoea, failure to thrive in an infant. Teuber and Peterson (1999)  reported angioedema, nausea, vomiting and asthma in 2 patients. Rosado et al. (2002)  reported anaphylaxis in a patient after eating cocnut icecream. Tella et al. (2003)  reported sudden abdominal pain, vomiting, oral allergy syndrome, and edema of the eyelids in a 3 year old child. Nguyen et al. (2004)  reported a patient with anaphylaxis with coconut and oral symptoms against hazelnut. Rosado et al. (2002)  used prick tests with coconut ice-cream and fresh coconut. Tella et al. (2003)  used a prick test with fresh coconut and with other foods. Nguyen et al. (2004)  used fresh coconut and commercial extracts of coconut, almond, Brazil nut, cashew, pecan, walnut, and hazelnut. Rosado et al. (2002)  found positive SPTs (wheal diameters of 9 and 13 mm, respectively) with both coconut ice-cream and fresh coconut. Tella et al. (2003)  found positive SPTs to coconut and negative SPTs to other foods except for a weak positive to almond (almond was negative on challenge). Nguyen et al. (2004)  found positive SPT to coconut and to several tree nut extracts. Food/Type of allergen:Slurry prepared from ground coconut, defatted and extracted in 0.06M Tris-HCl buffer containing 2% (w/v) SDS for 4 hours at 4°C. Slurry centrifuged at 3000g for 10min at 4°C. Supernatant passed through a 5.0-µm Millex-SV syringe filter (Millipore, Bedford, Mass) and then through an Extracti-Gel D AffinityPak Column (Pierce Chemical Co, Rockford, Ill) to remove residual SDS and concentrated (Teuber and Peterson 1999 ). Teuber and Peterson (1999)  and Rosado et al. (2002)  used Pharmacia ImmunoCAP (Pharmacia, Inc, Diagnostics, Columbus, Ohio). Tella et al. (2003)  used RAST. Teuber and Peterson (1999)  used sera from 2 patients. Rosaldo et al. (2002)  used sera from one patient. Tella et al. (2003)  used sera from one patient. Nguyen et al. (2004)  used sera from one patient. Teuber and Peterson (1999)  report both patients had strongly positive results to English walnut (food; class 5 and 4, respectively), coconut (class 4 in both), almonds (class 5 and 3, respectively) and one had reactions to peanut (class 5). Rosaldo et al. (2002)  found that specific immunoglobulin E (IgE) to coconut (CAP System, Pharmacia) was 18.30 kU/l. Tella et al. 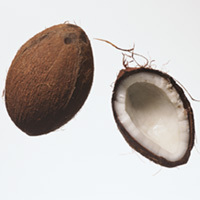 (2003)  found serum-specific IgE to coconut was positive (RAST class 3). Nguyen et al. (2004)  reported that serum specific IgE was present for coconut, hazelnut, Brazil nut, and cashew. Teuber and Peterson (1999)  used a12% SDS-polyacrylamide Laemmli gel. Samples were boiled for 5 minutes in sample buffer (60 mmol/L Tris-HCl, pH 6.8, 2% SDS, 10% glycerol, 100 mmol/L dithiothreitol, and 0.01% bromophenol blue), and electrophoresis was carried out overnight at 8 mA constant current with a SE600 Vertical Slab Gel Unit (Pharmacia Biotech, Piscataway, NJ). A was used. A nonreduced sample (without dithiothreitol) was also subjected to SDS-PAGE. Immunoblotting detection method:Teuber and Peterson (1999)  transfered proteins to 0.22-µm nitrocellulose membranes (MSI, Westborough, Mass) overnight at 30 V with a TE 42 Transphor Electro-Transfer Unit (Pharmacia Biotech). The reduced protein coconut blot was cut into 4 mm–wide strips containing 25 µg of protein per strip. Strips were blocked for 1 hour at room temperature in PBS/3% (w/v) nonfat dry milk/0.2% (v/v)Triton X-100 (TX-100). Sera, which had been incubated overnight at room temperature in PBS/3% nonfat milk/0.2% TX-100 and 400 µg/mL nut or coconut extract, were added to the strips and incubated overnight at room temperature. Strips from the nonreduced coconut blot were incubated with sera from the 2 patients, atopic control sera, and a buffer control. The strips were then washed for 20 minutes 3 times in PBS/0.01% TX-100 and incubated overnight at room temperature with 125I-antihuman IgE (Sanofi Diagnostics/Pasteur, Chaska, Minn) diluted 1:5 in the nonfat milk buffer. The strips were washed for 20 minutes 3 times and exposed to x-ray film at –70°C for 72 hours. Teuber and Peterson (1999)  report that IgE binding proteins of 55, 36.5, and 35 kDa were observed on the nonreduced coconut protein immunoblot and these bands were immunologically cross-reactive with seed storage proteins from walnut, almond, and peanut by blot inhibition. The 55 kDa protein was only reactive to sera from one of the two patients. Rosaldo et al. (2002)  report intense reactivity to a protein of 78 kDa in the IgE immunoblot, as well as weaker bands for 15-20, 22 and 30 kDa. They suggest that the lack of reactivity at 35-36 kDa may be because their patient was monosensitised to coconut. Tella et al. (2003)  report that IgE-immunoblotting after SDS-PAGE under nonreducing conditions showed an IgE binding protein of about 18 kDa, and two weaker bands of about 25 and 75 kDa. Nguyen et al. (2004)  reported IgE binding to 35- and 50-kDa protein bands in the coconut and hazelnut extracts. Inhibition assays using coconut demonstrated complete inhibition of hazelnut specific IgE, but inhibition assays using hazelnut showed only partial inhibition of coconut specific IgE. Food used and oral provocation vehicle:"maternalised" infant formula (Couturier et al. 1994 ). Symptoms:Couturier et al. (1994)  reported vomiting and diarrhoea. Teuber and Peterson (1999)  found that walnut (Juglans regia), peanut and almond extracts inhibited IgE binding to coconut proteins in sera from their patients. They suggest primary sensitisation is to walnut, with coconut a clinically relevant cross-reaction. Kim and Hussain (1999)  reported an instance of reactivity to coconut in a latex-allergic patient. Nguyen et al. (2004)  reported IgE cross-reactivity between coconut and hazelnut that was clinically significant and suggest that primary sensitisation in their patient was to coconut. There was IgE cross-reactivity to other nuts but no symptoms. 26.61% of patients in a food allergy clinic in India (Mumbai) reported allergic to coconut (Suraiya 1999 ). There are many references to allergy to coconut pollen but there are no reports of coconut pollen-allergic individuals suffering food allergy to coconut. Tella R, Gaig P, Lombardero M, Paniagua MJ, Garcia-Ortega P, Richart C.
Rosado A, Fernandez-Rivas M, Gonzalez-Mancebo E, Leon F, Campos C, Tejedor MA. Nguyen SA, More DR, Whisman BA, Hagan LL. Cross-reactivity between coconut and hazelnut proteins in a patient with coconut anaphylaxis. 32 kDa and 22 kDa by SDS-PAGE and 250-300 kDa by gel filtration (Plumb et al. 1990 ). Allergen epitopes:Not known but IgE only recognised the acidic polypeptide in a reduced form, and not when disulphide bonded to the smaller basic polypeptide. Nature of main cross-reacting proteins:Walnut (Juglans regia), peanut and almond extracts inhibited IgE binding to coconut proteins. Teuber and Peterson (1999)  suggest primary sensitisation is to walnut, with coconut a clinically relevant cross-reaction. Allergen properties & biological function:Cocosin is one of the legumin family of 11S seed storage globulins. Allergen purification:Meat from coconut was ground and defatted with petroleum ether and extracted overnight in 0.2M sodium phosphate, 0.2M potassium phosphate and 10% (w/v) NaCl (pH 6.8) at 4° C and for 30 min. at 40° C. Slurry filtered (several times with filter paper down to 0.22 µm pores) and butanol (33% v/v) added to the solution with stirring. Centrifuged at 16000 X g and the butanol decanted off. Dialysed against distilled water (several changes) and centriguged at 16000 X g for 30 min. Precipitate resuspended in 4% (w/v) ammonium sulfate and centrifuged at 38000 X g for 1 hour. The 33-50% ammonium sulfate cut was collected (centrifuging at 38000 X g for 1 hour) and the precipitate dialysed before gel filteration on Superose 6 HR 10/30 in 50 mM Tris/HCl pH 8.2 with 0.5M NaCl. The main peak was collected (Plumb et al. 1990 ). Two studies on the 11S globulin of coconut, cocosin, describe purification, characterization and crystallization (Balasundaresan et al. 2002 ; Carr et al. 1990 ). Sjögren and Spychalski in their initial purification (1930) gave a molecular mass of 208 kDa which is lower than more recent estimates. Teuber et al. (1999)  suggested that the 35 and 36kD polypeptides probably correspond to the acidic polypeptides of the 11S globulin but that the 55kD IgE binding protein is not the 11S globulin. Balasundaresan D, Sugadev R, Ponnuswamy MN. Purification and crystallization of coconut globulin cocosin from Cocos nucifera.